Ever owned a digital book signed by the author? No you haven’t. Home/Blockchain/Ever owned a digital book signed by the author? No you haven’t. Let’s talk about ownership. What does it mean when you own something? How do you start owning something? At the foundation of the superstructure of ownership lies the right to possess — to have exclusive physical control of a thing. Owning a physical book, for example, is pretty straightforward: after you purchase it or get it as a present, you can do whatever you want with it. You can scribble on the margins and dog-ear pages. You can gift it to a friend, lend it or write a dedication. You can sell it at garage sale. Whatever you do with a book adds a new layer of changes that turn it into a unique object. You might have never thought of it, but all the attributes of a physical ownership of an object do not really apply to the ownership of digital things. When we buy a digital book, we don’t “buy” it in a traditional sense, but license it according to a licensing agreement that comes along with all digital products. That means that when we “buy” a digital book we only buy the right to use it. We can’t alter it, copy for our own use, lend it to a friend (unless we lend it together with the device), give it away as a gift, or even keep indefinitely. We can’t bequeath it when we die. Bruce Willis, for example, got really upset when he learned he couldn’t pass his extensive iTunes library to his kids when he dies. When it comes to paper books — the fact that someone famous owned a book at a certain time can increase the value of the book tremendously. Book collectors can spend decades tracking down books signed by the author or inscribed by someone famous. Let alone the value of such books which reaches far beyond the value of a physical copy alone. In any palace museum around the world you will see thousands of trivial objects that once belonged to royal families, but it is because of this belonging at a certain time that these objects have become valuable. What if we tried to bring traditional concept of ownership to a digital world? Which digital processes and tools can we use to recreate the attributes of digital content ownership? These are the problems we explored with Google’s Creative Lab in Sydney, Australia. We chose blockchain as a technology to stage our digital ownership experiment. Blockchain is a public ledger which records all transactions that cannot be altered later. It is immutable — you can create content that can’t be easily copied. An excellent solution that saves all the facts of owning, using and altering a book for eternity — and by doing so brings the attributes of physical ownership to a digital world. 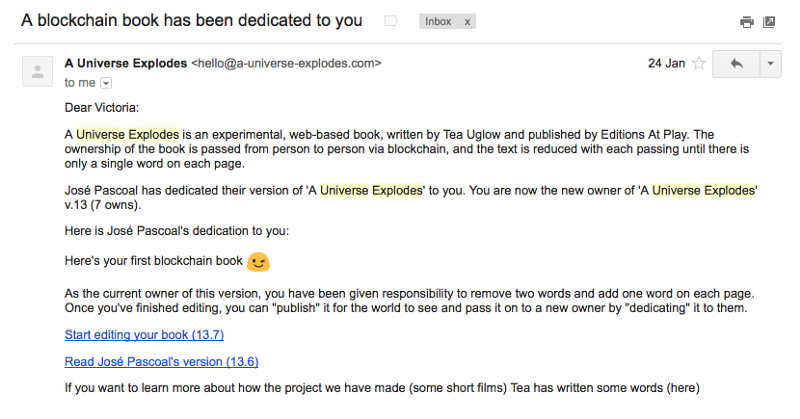 To demonstrate the concept we used a digital book “A Universe Explodes”consisting of 20 pages with 128 words per page. The idea was to pass (dedicate) the book from one owner to another by email. Each new owner will have to edit every page of the book — remove two words and add one (the analog of “do whatever you want with the thing you own” — so why not rewrite the book completely). When the current owner is done with editing, they would make a dedication to someone else and pass the ownership along. The goal was to reduce the book to one word per page. All the changes have been recorded on the blockchain creating the history of owners, alterations and dedications, making each copy of “A Universe Explodes” unique. Having the mechanics defined, we had to choose which blockchain to use to record everything. We went for Ethereum. One of the main reasons was that it has built-in smart contracts and intelligence within the blockchain itself that eases the data storage and the transfer of ownership. Smart contracts are blockchain-based programmable contracts that don’t only specify what happens after certain conditions are met (like traditional contracts), but also enforce the execution automatically. Blockchains contain records of all transactions between addresses. Addresses in a blockchain are accounts and contracts (sort of an identification number). An account is composed of a key pair — public key (the address) and private key. Each book owner would be represented by an account, so we needed to find a way to generate the addresses and give the private key to owners. The private key (a sort of an equivalent of passwords that we are used to access our digital content) is what allows an owner to make changes and record them on the blockchain. We wrote a smart contract that would manage the book ownership transfers, store and retrieve the changes and dedications as well as the owner names from the blockchain. In order to run, the smart contract needs gas (which is burned when smart contracts are executed, to essentially pay the network for the execution), so each contract is funded and manages those funds to ensure that owners have enough gas to make their changes. In the end, the remaining funds are transferred back to the contract creator. Pretty neat but too geeky for a common user, so we had to come up with an idea to put this behind the scenes. In fact users don’t even know that the application is using blockchain underneath, so they don’t need to understand how blockchain and public/private keys work. As mentioned earlier, we needed to give each owner their private key to allow them to edit the book and pass the ownership in the end. Since each book had an url, the way to enter edit mode was to append the private key to that url, so when an owner passed the ownership the api would return the next owner’s private key and the new owner would receive an emailwith the private key in the book url. Now, after all this geeky talk, here is how it looked when someone dedicated (i.e. passed the ownership) the book to you. All you had to do is click a link “Start editing your book”, make your changes, and after you were done — dedicate the book to the next owner by entering their email and writing a dedication. tea uglow, Creative Director for Google’s Creative Lab in Sydney, wrote this post that explains all the concepts and technologies that we’ve been working with for this project — ownership, blockchain, and Culture Blocks. There you can read about broader implications of the experiment. Following the logic of passing ownership through dedication, you can explore many other territories of digital content ownership. Just as we were giving the book to each other basically as a present, we could sell it as well and send it to a buyer by email. 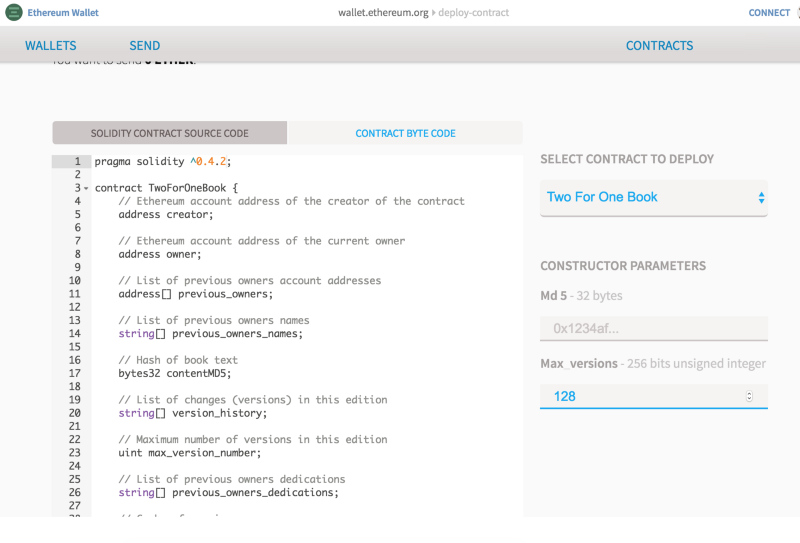 Smart contracts will do the work following the “if-then” premise — if a buyer sends funds for the book to the owner, then the book is sent to the buyer. Similar scenarios can be created for bequeathing and lending digital products. The most exciting part of this endeavour is exploring the numerous use cases of blockchain. A truly universal technology that can be applied in many more areas than fintech — traditionally associated with blockchain. If you have any projects or ideas that you would like to discuss with us — drop us a line at hello@impossible.com ! If you are as excited about blockchain as us, check Braveno — another blockchain-related project that we are working on.